Arrange a weekly delivery of flowers for the office with our professional team of corporate floral stylists. Tropical blooms work fabulously in an office reception area, their hardy, colourful petals adding life and vibrancy. 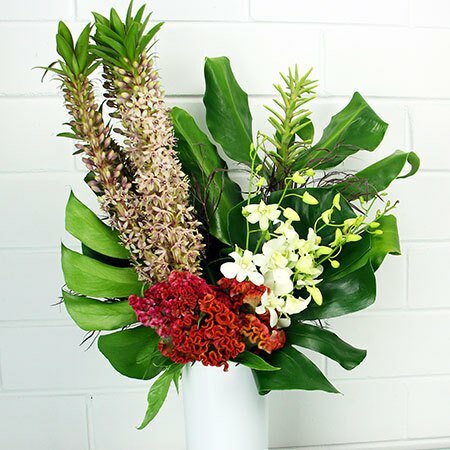 This medium height, front-facing vase arrangement features pineapple lilies, velvety celosia and classic white singapore orchids, combined with fresh tropical greenery. Dependent on what is in-season at the market on the day of your order, the team will coordinate your tropical vase arrangement based on the freshest flowers available. Colours and size can also be customised to match your office decor and space. For a free consultation, give our team a call on 1800 66 66 46 or email sales@flowersforeveryone.com.au. *Please note: The pictured blooms are subject to seasonal availability. Flowers for Everyone delivery weekly office flowers in the Sydney metro.